IT’S SUPERBOWL 50. Go the Broncos. The average cost of a Superbowl ticket is $10,000. Two Qantas jets in a near miss at Melbourne Airport yesterday. Caravan fire in Queensland that killed a woman has been deemed suspicious. Number of ISIL recruits pulled off planes in Australia has doubled. Driver missing after car plunges into flood waters near Rockhampton. Girl, six, critically injured after head on crash in Perth suburb. 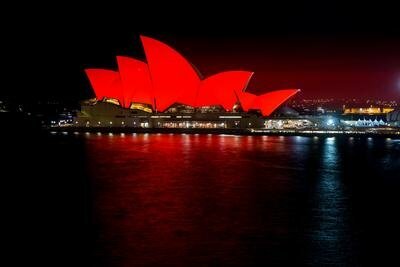 Sydney Opera House lit up red to celebrate the Chinese Year of the Monkey. See Pic. Good Samaritan glassed in the face in Sydney’s South East. NSW to make life jackets for rock fisherman compulsory. Stolen Perth Zoo tortoise found at a police station. Man killed in three car crash on the Picton Road. 11 yr old Perth boy in court today charged with murder. UN condemns North Korea’s missile launch. Jackie Chan bus explosion stunt on a London bus sparks terror fears. Elderly man knocked unconscious on a New Jersey street by a teen as part of a game. Jocelyn Elliot released in Burkina Faso by Al Qaeda after being kidnapped months ago. Her husband has not been released. Two teen boys have been killed using a Bob Sled on a closed ex Olympic Bob Sled track in Calgary. Earthquake in Taiwan has killed 32 people and trapped many others. Cameras capture America’s only wild jaguar….however there are many cougars in America.